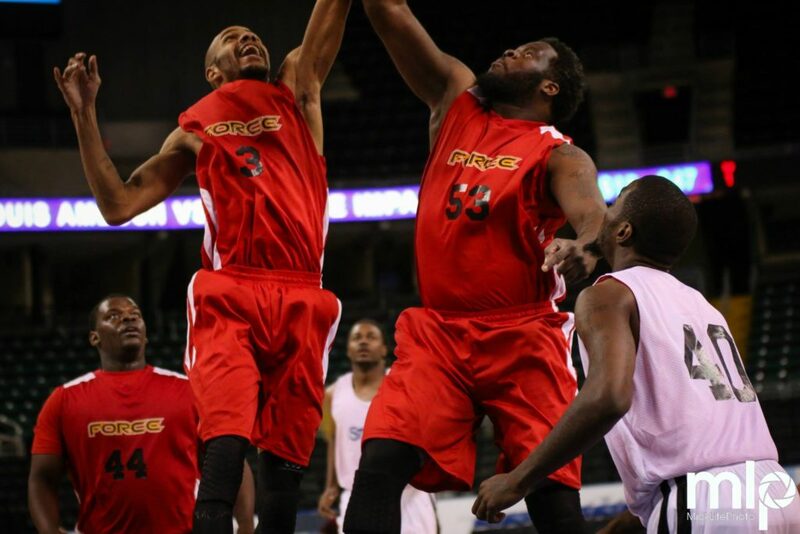 CHICAGO – The Gateway Steam could not get a game-tying shot off in the final seconds of Saturday’s game and the Chicago Force emerged victorious 104-102. The Steam’s fifth-straight loss dropped the St. Louis team’s record to 0-4 on the road and 1-6 overall. Chicago moved to 2-3 on the season and avenged their season-opening, 115-103 loss to Gateway. In a game that was close from opening tip to final horn, the Steam had a last gasp attempt to tie or win the game. The Steam’s leading scorer, Jake Anderson, caught an inbound pass with .9 seconds remaining around the 3-point line, but was double-teamed and the buzzer sounded with the ball still in his hand. Neither team could put a meaningful run together to get distance from the other. The teams’ scores appeared to be connected by a taut rubber band. A team would stretch the lead to just two or three points before the invisible rubber band would snap back in the form of an opponent basket and the score would return to an equilibrium. The pair played the first 12 minutes to a perfectly even 21-21 draw. The second was more of the same. The largest lead of the quarter was a 5-point edge in the final minutes of the half for the Steam, but they only led 42-41 at halftime. In the third, the Force were able to muster as much as an 8-point advantage, but the lead shrank to the more game-appropriate 71-69 Force lead heading into the final quarter. In the fourth, the Force’s greatest margin was once again eight, but down the stretch the Steam cut the lead to one possession to give themselves a shot. Force forward Antonio Ware hit a turnaround to put them back up 102-99 with 30 seconds left. A trio of split trips to the free throw line—2 for Force, 1 for Steam—made the count 104-100. Steam forward Lee Fisher converted a layup with just 1.4 seconds left for what appeared to be just a garbage-time layup. However, on the ensuing inbound pass, the Steam picked off a lob to mid-court and called a timeout with .9 seconds remaining down 104-102 to set up their final attempt. The Steam lost a game to the other occupant of the Kroc Center, the Windy City Groove, in a similar situation earlier this season. Unfortunately for the Steam, they once again came out on the short end of the last-second heroics. Chicago was led to victory by a superior performance by their front court. Forward Derrick McDonald posted a game-high and his personal season-high with 29 points and 16 rebounds. This was the fourth consecutive game McDonald cracked the 20-point mark and his fourth double-double of the season. Fellow big man, Antoine Ware, also dropped 23 points and had 13 rebounds. Ware must like his matchup against the Steam because his only other double-double this season came in their last meeting. The most impressive performance of the night came from a man who did not score a single point Saturday. Force center Ronnie Carlwell recorded a double-double the hard way with 13 blocks and 14 rebounds. Even more astounding, the 7-foot, 285-pound Carlwell had 10 blocks by halftime without recording a foul. Coming into Saturday, the Illinois State product had 7 blocks, total. For his record-setting performance, Carlwell was awarded Player of the Game honors by the MPBA broadcast team. The Force will be back in action at the Kroc Center Thursday, Feb. 5, as they play host to the second-place Champaign Swarm (4-1). The Steam were led by forward Lee Fisher with 25 points. Fisher has scored in double figures in each of his two games since joining Gateway. Will Kirksay — who also joined the team before their Jan. 25 game against the Bloomington Flex—scored 12 points. Jake Anderson threw in 14 points to score in double figures for the fifth straight game and his sixth such game of the team’s seven. The Steam look to snap their losing streak against their fellow tenants, the St. Louis RiverSharks Thursday at 7 p.m. at the Family Arena. The RiverSharks won their first battle of the season in the MPBA’s opening game 108-96. Both teams have made significant changes and had a month to play together, so it will be interesting to see how the pair of St. Louis squads match up this go around.